On the menu at Haley.Henry, a slate of mangalica. “Would you like to split a glass?” asks the server, sensing our hesitation to order two more large pours at Haley.Henry, the tiny new Downtown Crossing wine bar. “You read my mind,” I tell her. “That’s what we do,” she says. I’m not sure I have ever been in a restaurant where everyone is so happy. You’re greeted so earnestly that any awkwardness at the door melts away. A couple at the bar, asked to move down a seat so two stools are available side by side, aren’t the least bit bothered. And the staff reads minds. They certainly know what I want: boards with cheeses and meats, an open-faced sandwich covered with a sweet-sour-salty delight, panino with a filling you can’t get enough of, and tins of tuna, sardines, and other fish presented on slate as if the protein were gold. In fact, it is. Stacked up beside the bar — which has 18 seats and a couple of four-tops — are cans of premium fish from Portugal, Spain, and Washington State ($9-$28). You either love this stuff or you hate it. Or your grandfather ate it and you always thought it was gross. I was weaned on sardines; when I was a girl, my mother carried cans in case any of the kids were hungry. Haley.Henry is named for owner Haley Fortier, a former server at Sportello, who took the Henry from her father’s middle name. One of the things Fortier wanted to do is open any bottle of wine for two glasses, so you’re charged for a half-bottle, and she gets to expand her by-the-glass offers with the rest of it. Much of the list is from small growers who make limited amounts, many with a naturalist tilt; the staff likes introducing you to something new. One of the distinctive things here is how sardines are served. I ordered a tin from Lisbon because they’re the plainest. A little heap of Lay’s wavy potato chips come with them. Your sardine correspondent has never before eaten the little fish on chips, certainly not with aioli, pickled onions, and parsley. The fish, packed in an intense oil, comes boneless; it’s meaty and loaded with ocean flavor. You layer all this on a crisp little potato crinkle, add a squeeze of lemon, and you have something perfect. Downtown Crossing is changing fast. “It’s a fun part of Boston to be in,” says Fortier. The residential building that houses the bar was once a parking garage. At one end of Province Street is Old City Hall. Around the corner is Millennium Tower, which is selling condos for crazy-high prices. And in the midst of all this is a tiny bar with very tall ceilings, in a sleek, warm space of hand-hewn wood. There’s no real kitchen and “no back kitchen,” says Fortier. What you see behind the bar is all there is: a panini press, a two-burner induction top, a warming oven, and a meat slicer. Carolina Curtin (formerly at Menton, Sycamore, Liquid Art House) is doing wonders in this camp kitchen. Haley.Henry celebrates salty, smoky, intense tastes. Bottarga (sometimes called poor man’s caviar), the salted, cured, pressed fish roe that is served finely grated here, falls right into the wine bar palate. It comes with bread and butter ($6) so you can get a taste of this amazing stuff. Lamb tartare toast ($11) has heightened flavors with bottarga and arugula. Braised greens on toast with goat cheese ($8) are spiked with pickled red onions. 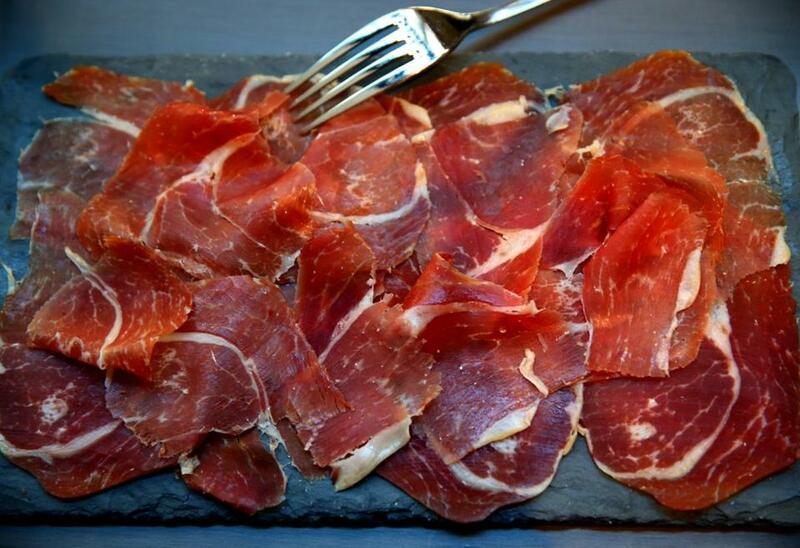 A slate of mangalica ($16) is covered with paper-thin slices of a cured pork that melts on the tongue. 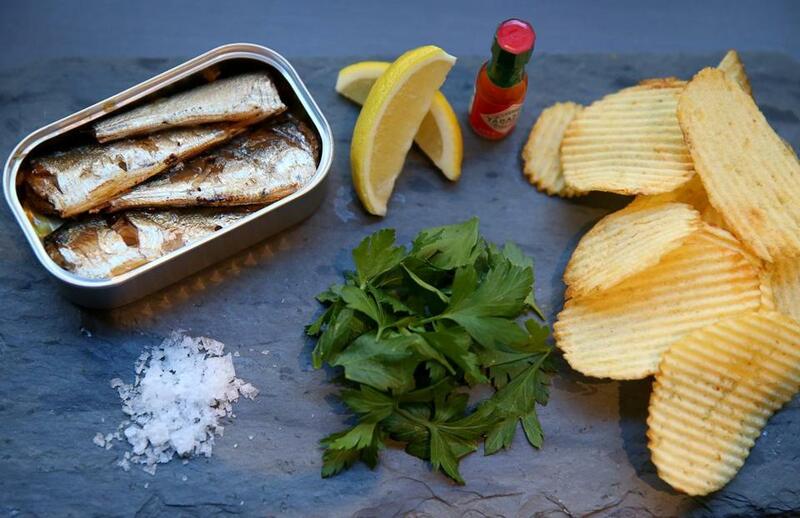 The Portuguese sardine board with potato chips. From the list of tins, tuna in olive oil from the Azores ($15) is a heavenly bite of fish, pink and mild and so nice with a dab of aioli. Smoked Washington State oysters ($16) are tiny, tender little morsels you might mistake for snails. One night, the panino of the day is filled with potato-chip chicken, which is baked with a crushed chip coating and tucked into the bread with tomato jam, chive aioli, and arugula. It’s hot and rich and deeply savory. Some of the cheapest parking in town is next door ($15 after 4 p.m. and on weekends), and the bar stays open till 1 a.m. That probably means that this likable spot will host off-duty chefs along with local office workers who stayed late at their desks and neighborhood millionaires from the luxury condos. If anyone can handle that mishmash, it’s this happy, mind-reading crew. 45 Province St., Downtown Crossing, Boston, 617-208-6000, www.haleyhenry.com. All major credit cards. Wheelchair accessible. Hours Mon-Fri 3 p.m.-1 a.m., Sat 11:30-1 a.m.
Prices Small dishes $6-$32. Toasts and crudo $8-$16. Tins $9-$28.